Lubrication equipment should be tailored to the particular application and take into consideration basic specifications including type of fluid, pressure, and temperature. Other factors may also be important to selecting the proper equipment: integration with existing machinery, minimized impact on the environment, cost-saving features, ease of installation, or sheer simplicity of design. The products on this page are examples of lubrication equipment that are meeting the challenges within industry today. 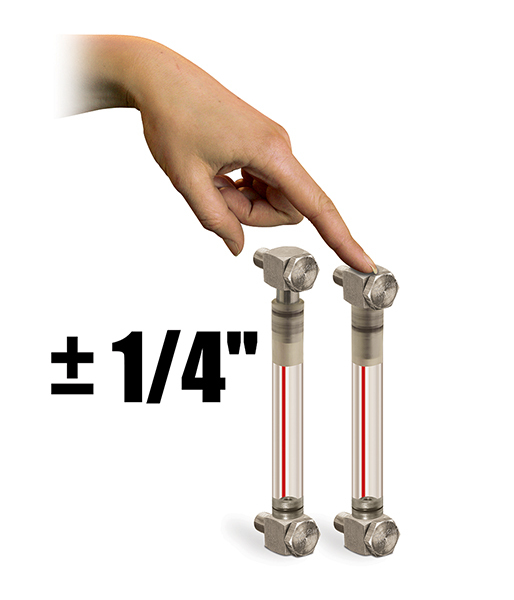 Liquid Level Gages with Adjustable Centerlines accommodate centerline distances up to 1/4" longer or shorter than the specified measurement, for total adjustability of 1/2". This range of adjustability compensates for variances that can occur during the production of plastic tanks. It is also suited to field installations where the distance between mounting holes may be less precise than in a controlled setting. The adjustment can be made by hand, facilitating simple installation. Liquid level gages are used to view liquid levels in hydraulic reservoirs, tanks, large steel mill pumps, gearboxes, bearing housings, hydraulic equipment, crankcases, transformers, and machinery oil reservoirs. There use can be extended to many industrial liquid level viewing applications. Nylon liquid level gages with adjustable centerlines feature a round rigid nylon sight that is clear and durable. Liquid level and clarity can be viewed from all angles. A red line on the back of the sight enhances liquid level visibility. The length between the center of the two mounting bolts is referred to as the centerline. Gages are available with centerline measurements ranging from 3" to 36". Traditional liquid level gages require that the centerline length be within 1/32" of the distance between the two mounting holes. Nylon Liquid Level Gages with Adjustable Centerlines offer a distinct advantage for applications where the distance between the two mounting holes may fluctuate. They feature a centerline distance that can be lengthened by 1/4" or shortened by 1/4", for a total adjustable range of 1/2". For example, a gage with a 6" centerline can acommodate a centerline length from 5 3/4" to 6 1/4". This adjustment is made by hand without the use of tools. No disassembly is required. 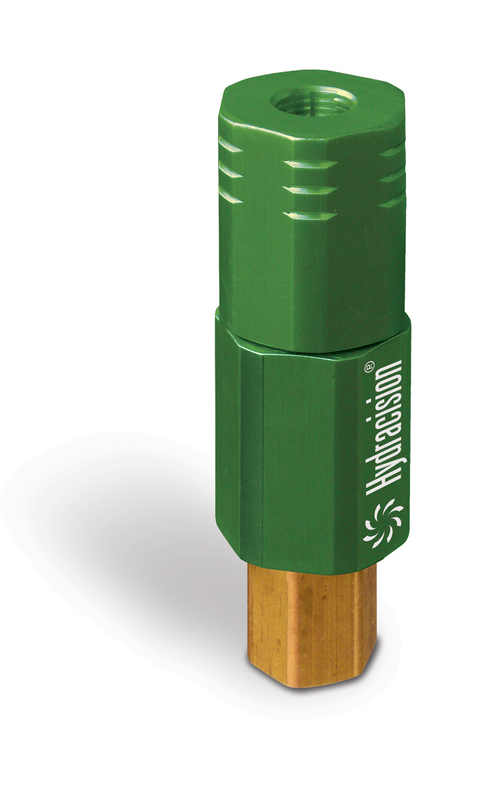 Hydracision distributes lubricant to many separate points – as few as 12 and as many as hundreds. It combines hydraulic movement of fluid with the precision of positive displacement injection. Hydracision supplies the user with options but doesn’t overwhelm with calculations, complex components, or pages of schematics. It’s simple to configure and use. The reservoir housing contains a gear pump motor, which pressurizes the outlet for uniform fluid distribution. A PLC with a programmable display allows selection of lubrication cycles. A low level switch prevents operation when the oil supply is depleted. The pressure gauge at the outlet provides visual confirmation of the hydraulic cycle. Fill the reservoir using the swing-away cap with a removable strainer to help maintain liquid quality. Injectors deliver lubricant when the pressure peaks. The injectors reset as the pressure is relieved during a timed cycle. 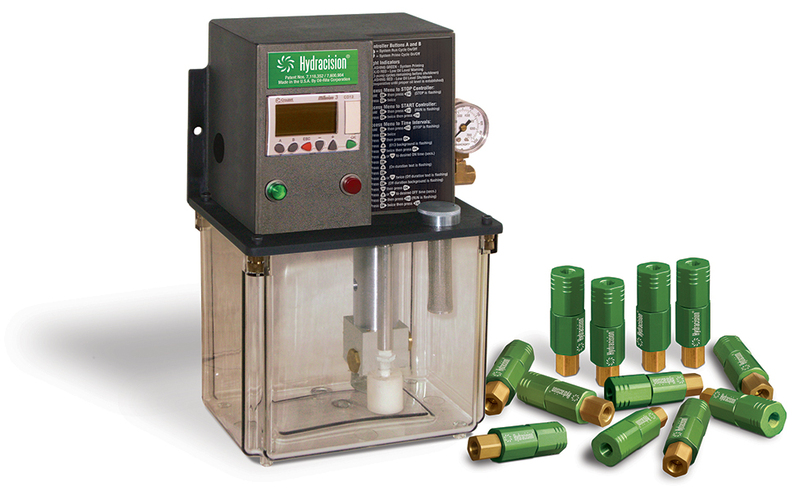 The user can schedule the interval at which lubricant is dispensed using the self-contained electronic control. Hydracision injectors operate under pressure generated by the central housing, yet each injector functions independently of the others. Disrupted output at any one lubrication point has no affect on the other injectors. Dispensing is consistent and reliable. Hydracision can be supplied with up to hundreds of injectors, each with a high, medium, or low dispensing volume (0.20 ml, 0.14 ml, or 0.08 ml). The amounts do not have to be the same for each injector. Hydracision is a reliable, efficient lubrication method for printing presses, injection molding, packaging machinery, punching presses, assembly systems, canning operations, conveyors, manufacturing processes, and machine tools. 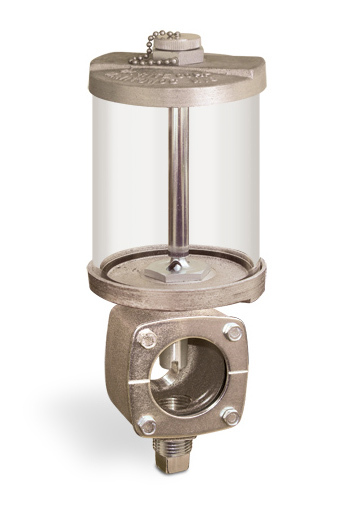 Universal (Bulls-Eye) Sight Feed Valves allow visual observation of the liquid stream from a distance, with the volume of flow controlled by an adjustable needle valve. Bulls-eye sight feed valves have excellent flow characteristics with low pressure drop. These units are principally used on gravity or pressure lubricating systems of larger machinery where considerable capacities of oil must be dispensed. The sturdy construction makes them especially suitable for paper mill machinery, steel mills, rolling mills, sugar mills, steam and gas engines, gear units, etc. Their use can be extended to any application requiring adjustable, visible flow control. Large glass sight windows on both sides of the valve are gasketed to prevent leakage and permit excellent observation of the liquid stream. Threaded retaining rings on both sides secure the glass. The sights can easily be removed for cleaning or replacement without disconnecting the valve. The valve can be provided with t-handle or tamperproof adjustment. 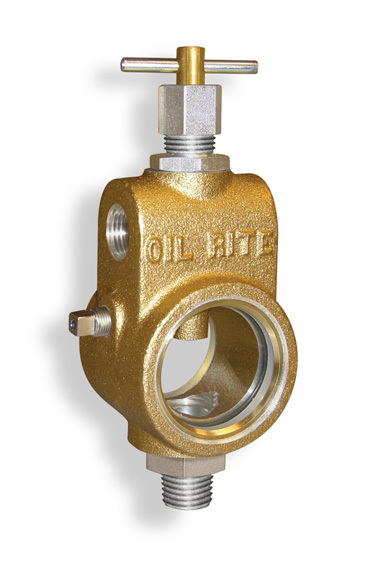 To view Oil-Rite’s selection of Universal Sight Feed Valves, click here. To browse Oil Flow Control Valves in the online catalog, click here. Stainless steel 303/304 is known for its non-corrosive and non-magnetic properties. Because it is resistant to corrosion, rust, and staining, it maintains its appearance over long periods and minimizes unwanted bonding between parts. It seldom requires plating or painting, which can eliminate additional operations from manufacturing and assembly. Oil-Rite has the capability to machine parts from stainless steel 303/304. The material is harder than steel, which can result in slower production times and increased wear on machinery. 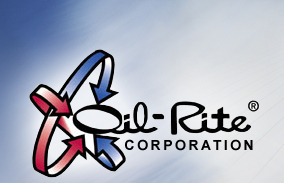 Oil-Rite has fine-tuned its method of machining stainless steel and is proficient in large quantities using stock sizes up to 1” round diameter and ¾” hex. 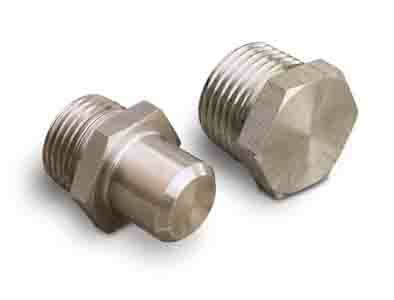 Pictured here is a solid plug with a 1/2” NPT thread (right) and a hollow cup with 3/4 -16” UNF-2A thread (left). PurgeX Circulating Oil Systems are easy to use, reliable and compact. They provide the means for dripping oil over gears, bearings, crankshafts, etc, with the intent of collecting and re-using the fluid. These units are ideal for small volume applications where excessive heat build-up is not a concern. They can be used with bearings, motors, fans, rolling mills, presses, pumps, compressors, gears, generators and a variety of other applications. PurgeX Circulating Oil Systems are operated with 1 to 4 motor driven PurgeX pumps. The pumps cycle small, precise amounts of lubricant at frequent intervals. The fluid is recovered by means of gravity and is subject to passive heat loss as it circulates back to the reservoir. A clear and durable 1 gallon acrylic reservoir collects and circulates fluid. The hinge lid cap makes filling the reservoir quick and simple. A 40 micron filter removes impurities from the fluid before it cycles to the lube point. The filter is easily accessible for cleaning or replacement. PurgeX Circulating Oil Systems are easy to install; simply route tubing to the lube point and back to the reservoir’s return. 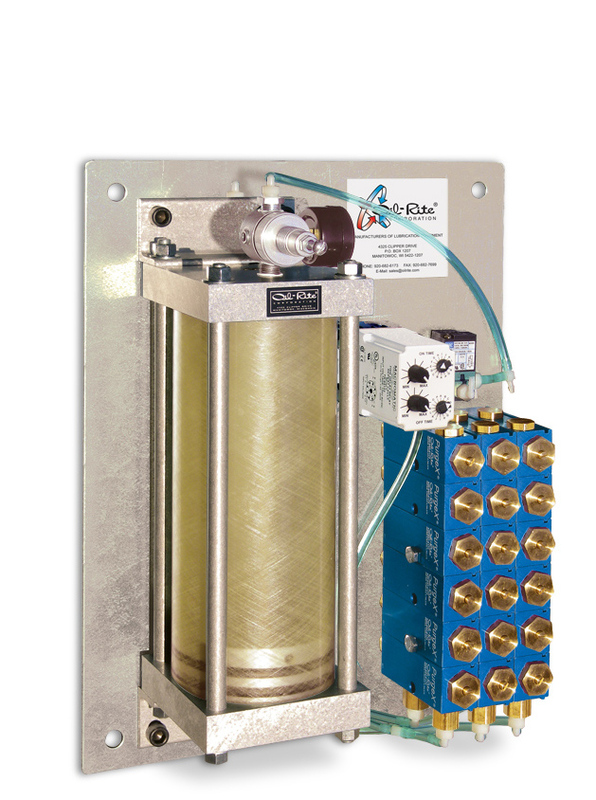 Activate the mini circulating oil system with a standard power supply. For more information, browse PurgeX Circulating Oil Systems in in Oil-Rite’s clear and detailed online product catalog. PurgeX Multi-Point Precision Grease Lubrication Systems are reliable, economical, and easy to install. These systems feature up to 42 adjustable, patented PurgeX pumps with a 3-way air solenoid, 1/2 gallon pressurized grease reservoir and programmable cycle timer. The complete lubrication system is mounted on a galvanized steel plate. The system requires only compressed air, electricity, and lubricant to begin operation. Self-priming PurgeX pumps are designed to provide optimal lubrication by distributing very small amounts of lubricant over steady intervals. Each PurgeX pump has a grease delivery per cycle adjustable between 0 to .012 cubic inches, or roughly the area occupied by a pencil eraser. The output of each pump can be independently and accurately adjusted by using the external knob located on each pump. The cycle timer can be programmed to lubricate from every .6 seconds to every 24 hours. Greater volumes of lubricant can be applied by increasing the frequency of the cycle. With PurgeX systems, there is no need for high pressure lines, a central gear pump or complex controls. The 3-way air solenoid requires only one low pressure air connection of 40-120 PSI to operate the entire lubrication system. The 9 to 1 piston ratio inside each pump converts the low pressure shop air into as much as 1,080 PSI at each outlet. This PurgeX Multi-Point Precision Grease Lubrication System is easy to install. Simply secure the mounting plate, connect compressed air, supply power, and route tubing from the outlets to the lubrication points. View our selection of Complete PurgeX Systems, or browse PurgeX Pumps. Constant Level Lubricators automatically maintain a fixed liquid level in a bearing housing or gear box using the liquid seal principle. Constant Level Oilers can be used on sleeve bearings, anti-friction bearings, gear boxes, pump housings, ventilating fans and blowers, moistening pads, and any other application demanding the maintenance of a constant liquid level. 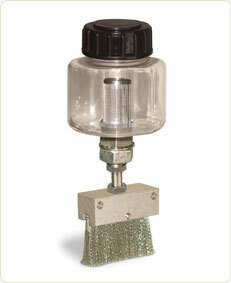 Oil-Rite Constant Level Lubricators feature a unique, mess-free design that allows the reservoir to be easily refilled through a top filler cap. A shutoff valve holds the liquid in the reservoir when the filler cap is removed. The lubricator resumes normal functioning after the cap is screwed down again. These Constant Level Oilers are available with acrylic or Pyrex reservoirs in a variety of capacities. They feature a large oil level sight for viewing liquid level and condition. Models are also available with an adjustable oil level feature, low level safety switch, or both. Click here to explore Constant Level Lubricators in our detailed online product catalog. Liquid Level Gages can be used to view liquid levels in hydraulic reservoirs, tanks, large steel mill pumps, gearboxes, bearing housings, crankcases, transformers and machinery oil reservoirs. Their use can be extended to many industrial liquid level viewing applications. This custom built Liquid Level Gage is constructed with sturdy 304 and 303 stainless steel components. 304 stainless steel is commonly required in the chemical and food and beverage industries. 304 steel has corrosive resistant properties and responds effectively to climate conditions; this gage tolerates up to 225° F.
A standard configured gage has the viewing area facing forward, while this gage has the glass sight oriented at 90° angle to the tank. The mounting bolts are reversible, allowing the gage to be installed with the sight oriented to the left or right side. The glass sight has silk-screened level-markings to clearly indicate fluid level. Leak-proof construction is achieved with Viton seals. To view a detailed product description of this custom Liquid Level Gage, click here. This lubrication system was engineered for a primary manufacturer and developer of military aircraft engines. The department it is designed for is responsible for engineering easily maintainable jet and rocket engine test stands. 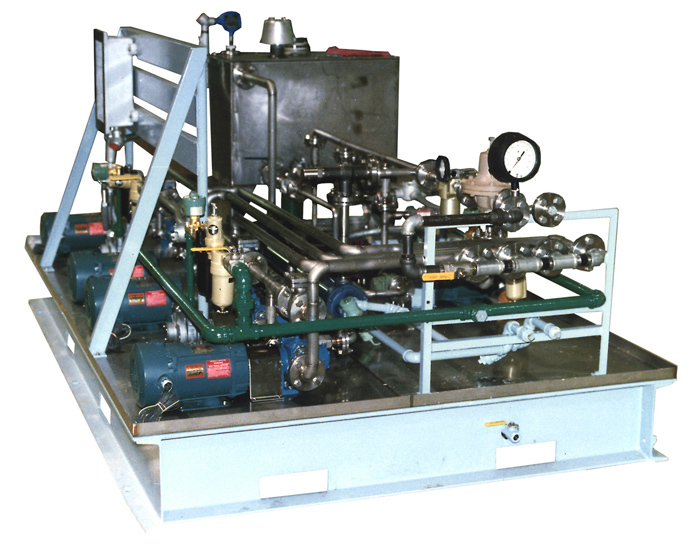 This circulating oil system is used in an engine test facility. It provides lubrication for two water break type dynamometers used in two separate test stands. The water breaks are used to simulate the different loads the engines are exposed to under actual flight conditions. High speed rotation and power absorption produce considerable heat. The Oil-Rite lubrication system provides adequate lubrication and cooling of the bearings during test operations. For more details on this circulating oil system, click here. To browse circulating oil systems in our product catalog, click here. 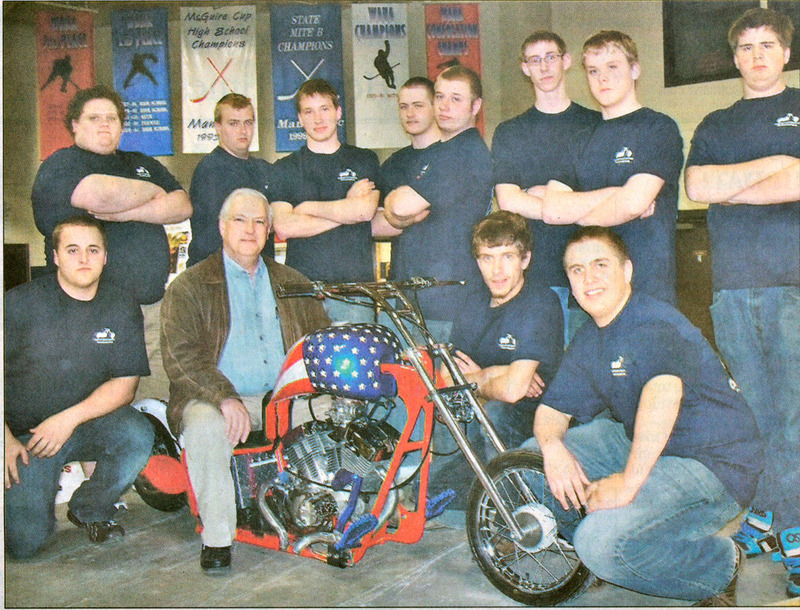 The competition for Best Overall Bike is part of a Manitowoc county-wide effort to improve the image of manufacturing. It helps students, parents, educators and the community to distinguish manufacturing as an excellent career option. It is a rewarding project for students and an outstanding opportunity for Oil-Rite to connect with individuals who are the future of engineering and manufacturing. It is "much more than building a bike, much more," said Joe Teresi, Plant Manager of Oil-Rite Corporation. Spray dispensers are used to apply liquid to conveyors, chain drives, bull gears, trolley wheel bearings, and wire rope. Many of these applications are intended to run non-stop. When the liquid is consumed from a standard dispenser, the operation either runs temporarily without fluid or is shut down while an attendant refills the reservoir. The auto-fill spray dispenser utilizes alternating reservoirs in a controlled sequence to attain an "always on" status. It can eliminate the costs of an attendant and periodic shutdowns. During the time that one reservoir is pressurized and dispensing, the other reservoir is depressurized and refilled from an external fluid source. Level switches in both reservoirs signal when reservoirs require refilling as well as when they have reached capacity. 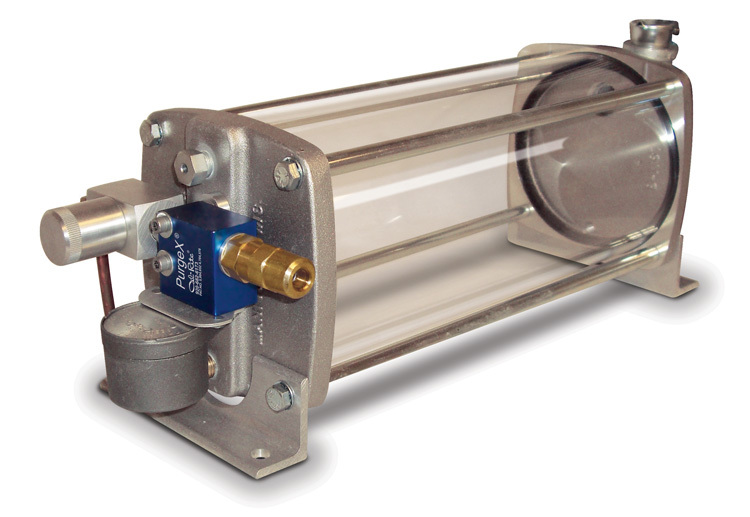 Solenoids manage the availability of pressurized air and fluid. A programmable logic control (PLC) controls the function of the unit. The unit is plumbed, wired, and programmed within a neat package and a compact footprint. Installation requires connection to pressurized air, a fluid source, and standard electrical current. The unit is configured efficiently, so that connections to each individual component are not necessary. One or a number of spray valves can be connected to the single outlet in the same manner as a standard dispenser. For additional product information, click here. Washdown is a daily occurrence in many food processing and packaging environments. The cleaning agents can corrode metal parts within only a few days. The Washdown Oiler is designed for these harsh conditions. The materials used in this oiler resist corrosion. The bottle is polycarbonate and the cap is polypropylene. The filter has a stainless steel screen on an aluminum body. All other components are stainless steel, including the brush bristles. The washdown removes not only dirt from the equipment, but also the oil on chains. It is important to reestablish an adequate level of lubricant on the chain as soon as the equipment is put back into operation. The Washdown Oiler works on the premise of rapid lubricant replenishment. It has a 5 oz. reservoir that is intended to be filled at start-up. The oil makes it way to the brush through a small orifice. Depending on oil and environmental conditions, the oil is dispensed at a controlled rate over 15 to 30 minutes. The brush height is adjustable by ½ inch to compensate for wear. A 5/8 – 18 threaded shank with nut allows for mounting to a bracket. To view this product in the catalogue, click here. This PurgeX system is a complete lubrication package, especially suited to environments where moisture or water may come in contact with equipment. The Stainless Steel Nema 4X enclosure and the polycarbonate reservoir stand up well to regular washing. The outlet fittings are also stainless steel, ensuring that all external components are resistant to corrosion. The unit is commonly used in food processing facilities. The “Ready to Go” System is compact, simple-to-use, economical, and reliable. It contains all of the essential components of a complete lubrication system. The patented PurgeX pumps have the ability to deliver very small amounts of lubricant with each cycle. Each feed has a separate, easy-to-use adjustment stem to control the precise volume of output. Lubrication can be set to cycle at specific intervals using the included timer. The unit operates using standard shop air (40-120 PSI) and 120V/60Hz. 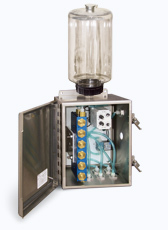 A stainless steel, hinged-door enclosure houses a manifold of 6 air operated PurgeX pumps, a timer, and a 3-way solenoid valve. There is an external, shatter-proof 1/2 gallon polycarbonate reservoir that allows for visual observation of the liquid level. The system is quick and easy to install. Simply secure the bracket, connect compressed air, supply power to the solenoid, and route tubing from the outlets to the lubrication points. The part number for this product is YB4366-1. “Ready to Go” Systems are also available with different PurgeX pump quantities and come in a standard Nema 12 enclosure (part no. B3471). To view additional complete PurgeX lubrication systems, click here.